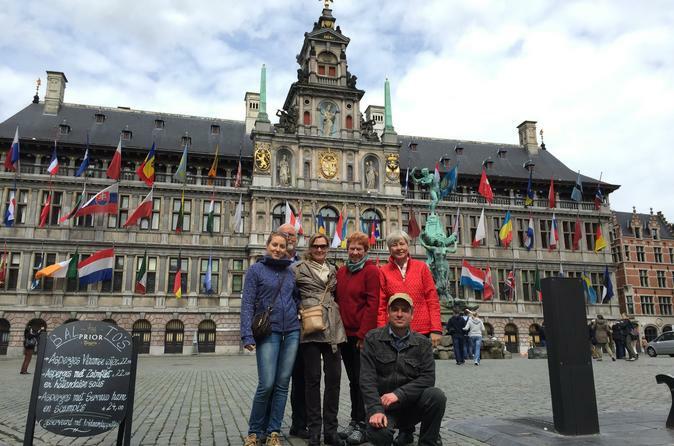 Immerse yourself in the Middle Ages during this 3-hour walking tour of Antwerp, accompanied by a personal guide. Wind your way through the city's cobbled streets and hear about the history of important landmarks like the Grote Markt, the fortress of Het Steen, and the Plantin-Moretus Museum. Listen to your guide's stories about Antwerp's checkered history and see where the locals mingle by stepping into a pub to purchase a drink. This private tour can be customized to suit your interests. At a time that works best for you, meet your private guide at your Antwerp hotel, Sint Jansvliet square or the entrance to the pedestrian tunnel at the Scheldt River. Get an overview of the medieval city center from your guide, then set off on foot to uncover Antwerp's checkered history. See the Belgian city's many richly designed monuments, and hear exciting stories of the city's past from your experienced guide. Wind your way through the Antwerp's cobbled streets and hear about the history of important landmarks like the Grote Markt, the fortress of Het Steen, and the Plantin-Moretus Museum. This private tour can be customized to suit your interests, and you'll get plenty of personalized attention from your guide. Midway through the tour, see where the locals spend their time as you pop into a pub to purchase a drink. Over a locally brewed beer, get insider's tips from your guide on how to maximize your time in Antwerp. The tour ends after three hours at the outdoor plaza Sint Jansvliet.